By Jim Dower: Tonight’s clash between former WBO heavyweight champion Joseph Parker and Dillian Whyte will be battling in London in a fight that could decide the April 13th opponent for heavyweight champion Anthony Joshua at Wembley Stadium in London, England. Whyte and Parker need this fight for them to improve their chances of facing Joshua next April. WBC heavyweight champion Deontay Wilder is the fighter that Joshua wants to face on April 13, but it’s not looking like the fight will take place. Whyte (23-1, 17 KOs) and Parker (24-1, 18 KOs) have impeccable records and are rated in the top five of the division. The fight is considered a 50-50 flash with little separating them. Whyte and Parker were both beaten by Joshua. Parker’s lost came by a 12 round decision last March in a fight that was marred by the referee, who kept the fighters from mixing it up in close. With the referee keeping Parker from fighting in close, the 28-year-old Joshua used his size to jab his way to a lackluster decision. Parker received credit at least for extending Joshua the full 12 round distance, which was the first time in his career that he’d been forced to go the full route. Of course, Joshua’s opposition during his career has been less than spectacular. His best opponent thus far is an old Wladimir Klitschko. Parker was Joshua’s first prime opponent that wasn’t held back by injuries. For his part, Whyte was knocked out by Joshua in round 7 in 2015 in a fight that was competitive for the first two rounds. The fight stopped being competitive after Whyte reinjured his left shoulder in the 2nd. Whyte, 258 pounds, will be enjoying a 16 pound weight advantage over the 242-pound Parker. However, being the heavier fighter doesn’t mean that Whyte will win. If the fans remembered Whyte’s fight against Joshua in 2015, he outweighed Joshua and yet he still lost the fight by a 7th round knockout. being the heavier fighter for tonight’s clash could only mean that Whyte has more weight to lug around the ring for 12 rounds, and that’s not a good thing when you’re fighting a mobile guy with the speed of Parker. A smarter move for the 30-year-old Whyte would have been for him to trim down for the clash to get as low as he can to match the speed and mobility of the New Zealander. The loser of tonight’s fight will need to go into the rebuilding phase of their career to try and climb back up the rankings. Whyte will have the easier chance of getting back to the top due to his promoter Eddie Hearn of Matchroom Boxing being the promoter of Joshua. Even if Whyte loses to Parker tonight, he’ll likely be given a world title shot against Joshua after three or four fights. 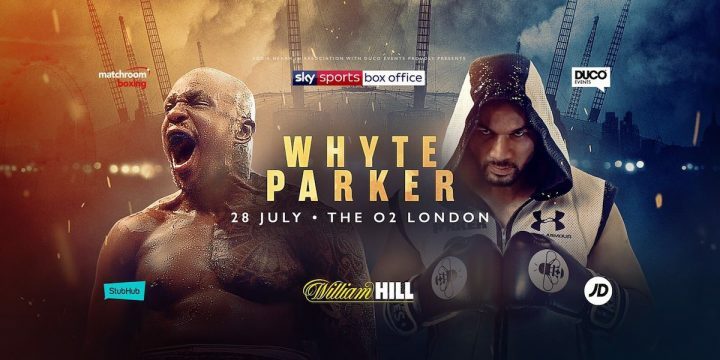 ”I think sometimes ‘smack talk’ is a sign of doubt, and also it’s a sign of trying to convince himself, and convince others that he’s ready for this challenge,” Parker said to skysports.com about Whyte. As you can see, Parker, 26, sees Whyte’s constant trash talk as a sign of self-doubt. Parker feels that Whyte is talking constant trash in order to convince himself that he can measure up with the best in the heavyweight division. To be sure, Whyte has failed in his only attempt at the big time in facing Joshua. In Whyte’s other notable bout in his seven-year pro career, he looked bad in winning a 12 round split decision win over Dereck Chisora in 2016. Chisora looked like the winner in that fight. Whyte’s decision not to try and clear up the controversy by facing Chisora in a rematch has weakened his standing in the eyes of the boxing public, given how bad he looked in getting hurt three times in the match and almost stopped. Former WBO champion Parker is known for his hand/foot speed and strong punch resistance, as well as his ability to box at a high level. He’s never been knocked down during his career. Parker took Joshua’s best shots last March and he was never at any time in the fight on the verge of going down. On the contrary, it was Parker who hurt Joshua in the fight and looked to have him buzzed several times. For Whyte to hurt Parker, he’s going to need to show power that he’s not displayed in the past. Whyte’s right hand power is more of a slapping type of power. His bread and butter punch is his left hook to the body. However, for some reason Whyte is unable to hurt his opponents when he throws his left hook to the head. That could be a product of his left shoulder surgery in 2015. It’s likely a range of motion issue for Whyte. It’s not going to be easy for Whyte to get in range to throw his left to the body of Parker because of his quick feet, and his fast hands. Whyte needs Parker to stand without throwing shots back at him for him to drop his head and throw his left hooks to the body. Whyte was able to do that in his fights against journeyman Malcolm Tann and former WBA heavyweight champion Lucas ‘Big Daddy’ Browne. Both of those fighters were slow, easy to hit, and unable to throw shots back at Whyte quick enough to make him think twice about throwing his body shots. “Parker didn’t make the decision to go after [Joshua]. Now he regrets it. To me, that’s a coward’s mind-set,” Whyte said to Sky Sports in slamming Parker for failing to be more aggressive against Joshua last March. Sky News analyst Carl Froch believes that Whyte can’t afford to get in a boxing match against the superior boxer Parker tonight. Whyte’s best chance of winning the fight is to try and turn it into a war and hope that his power is enough for him to win. If Parker is able to box, he’s going to have too much talent for Whyte to overcome in this match. Whyte will lose for the second time and will need to wait a little longer before he gets his eventual rematch against the fellow Matchroom Sport promoted Joshua. As I mentioned previously, Whyte will soon get a second fight against Joshua, no matter what takes place in tonight’s match. Hearn wants to see a Joshua-Whyte rematch and so does the British boxing public. But it’s still going to take Whyte a year or two to come back from a loss to Parker. ”Whyte is going to have to fight, boxing on the back-foot isn’t an option,” former super middleweight champion Carl Froch said to skysports.com. Whyte is like a slower, weaker Carlos Takam, and that’s not good for him. Parker was able to outbox Takam to win a 12 round unanimous decision. Whyte has to put pressure on Parker and hope that he can force him to abandon his game plan to fight his game. Parker will outsmart the 30-year-old Whyte and beat him by a 12 round unanimous decision. I don’t see Parker being able to stop Whyte, because he’s almost impossible to knockout unless he’s hit for a prolonged period of time with power shots the way that Joshua did in 2015. Whyte looked exhausted more than hurt at the time of the stoppage in that fight. Since then, Whyte has put more emphasis on his stamina to improve his conditioning. Still, he doesn’t have the best engine, and he might fall apart if Parker is able to force him to fight hard for three minutes of each round tonight. Whyte’s best and perhaps only chance of winning tonight is for him to make the rounds close enough for him to win a decision. You have to believe that any close rounds will go to Whyte due to him being the home fighter in London. The crowd will be cheering for Whyte throughout, which will likely have a huge influence on the three judges that are assigned to the fight. However, Parker’s amazing boxing skills will make the rounds one-sided enough for him to win a clear decision.